Thank you for such a useful website, which I used before taking our Standard Poodle to Spain from Glasgow last September. The driving was tedious and obviously v. long, but we had frequent stops and overnight stays in England and France. The dog got a bit fed up, but was fine and settled immediately on our arrival at the rented cottage in a village near Cuidad Rodrigo. The owner of the cottage arranged vet’s appt before return, so that was not a problem. However, rural vets may not speak English -I wrote the pet passport (treatment before return)regs in Spanish for the vet. treatment was cheaper than in UK. Everywhere we went people fussed over the dog, in France and Spain. it was never a problem eating out, we sat at tables outside. The only advice I would give is to take wee snacks for your dog while travelling – ours didn’t eat a mouthful of her usual food until we got to the cottage. I am bringing my dog to France. I have some concerns as my Mother’s dogs live on a farm and have not been around other dogs. Will it be safe to bring him here. They have all been neutered but will my dog get on with two dogs who have only seen maybe two dogs in their lives. They are 6 years old and my dog is a rescue dog and is about 3 years old. Any advise would be appreciated. I sympathise with your concerns. I’m not sure when you plan to travel but is there any chance you can start ‘socialising’ your dog before your trip to France? My advice would be to find a dog training group in your area, if there is one, so that your dog could meet other dogs and you can also get advice. One of the most important aspects of dog training is socialising with other dogs – difficult with rescue dogs so perhaps you could at least make a start with this? Otherwise – maybe take the dog to areas where there will be dog walkers and reward him for good behaviour and not pet him if he shows fear (which is rewarding unwanted behaviour.) It would obviously help if your dog could meet other quiet, well behaved dogs rather than boisterous ones which may wind him up! Very best of luck and I hope you have a good trip. Thank you for your advise, will try what you suggest. I hope you don,t, mind me asking. How did your dogs cope with their journey..I am thinking of travelling with my dog in the future, I am a bit nervous I must admit..
We are lucky that greyhounds travel very well – plus of course the motorhome has a sofa for them to lie on! I think that this is a stupid question, but I have to ask anyway. We are travelling to France via the Eurotunnel our dog has had all vaccinations including the one for rabies, do I need to see a vet once we arrive in France and if so how quick once we get there. Don’t worry – vet stuff happens on the return leg = all you need to know is on this site…. Hi we have 6 dogs and need to travel back and forward to Uk from Portugal i.e. thru Spain/and France they have all pet passports and up to date vaccination but rumours are now that they must be caged or muzzled and may need insurance in case they bite anyone. It could be yet another ploy for fines as they are in abundance in Europe but does anyone know for sure ?? Thank you for this excellent site – it has helped enormously. We are taking our labrador across to France next week and think we’re just about prepared! I understand all the legal requirements for her passport etc, but I would just really like some advice on her flea/worming regime whilst we’re away. – She will be wearing a scalibor collar – just in case we venture into areas with Sandfly. We will be putting that on her tomorrow (the Vet gave us a Seresto collar and I’ve just checked and that doesn’t protect against leishmaniasis!) I’m assuming the scalibor protects against ticks too. – She had her last worming table (Milbemax) 3 weeks ago – I normally give these every 3 months, but I was going to give her one in a weeks time and then once a month for 2 more months (covering the time we’re away and a month when we’re back). – She had her usual topical flea treatment Advocate – 4 weeks ago and she is due another dose the day we leave, I give this treatment monthly. However, I wanted to check if I should change to Frontline? Are there flea treatments that react with the Scalibor collar? We’re away for three weeks, should I give her another treatment when we’re away? Any advice of the right combination of worm/flea/tick treatment would be very helpful. Oops, sorry Amanda, didn’t use the reply thingy, still better late than never. I don’t think that there are any legal requirements for cages, but if you read my input below you’ll see why a crate is useful. Lucy is a Weimerarner cross German Shorthaired Pointer and at home stays overnight in a 48″ crate but when travelling she goes into a 36″ crate as she curls up in there quite securely and goes to sleep. We stop regularly for doggy breaks and a biscuity bone ensures prompt re entry. We bought our crates online from amazon they are all about the same, just the sizes and prices differ a bit. Dogs can’t see accidents about to happen and can’t brace for impact as we humans do. Crated animals don’t travel any distance in an accident so shouldn’t suffer any internal injuries but it is worth getting them checked out at a vets post incident anyway. Uncrated animals will hurtle through any unoccupied space until they hit something. Probably the back of the drivers or passengers head – this is the equivalent of a smack to the back of the skull of around a ton. Not good for you and not good for the poor old dog either. I have attended many RTAs (or RTCs now) and none of them are something I like to remember, so please do yourself and the pup a great big favour and make sure that they, and anything else in the vehicle, is secure. You can buy water bowls for crates (coop cups) that strap to the inside, we don’t bother anymore as Lucy simply spills them and she seems to prefer dirty puddle water over anything we give her, and as I say we stop quite regularly for doggy breaks. What a great site for info and sharing experiences, I wish I had found it sooner. We travelled with our dog to France for the first time in our motorhome in March this year and what a great experience. We stayed at both Aires and campsites (mainly stayed at the campsites to stay for a few days in the same place) and the aires were for the most part fantastic. Lucy always travels in her crate as she feels more secure there and can’t be rolled around, plus she can’t come and join me and help to do the driving as she would if she were loose. Going through the customs crated dogs don’t need a muzzle on either, if in France or particularly Spain an unmuzzled dog can get you a fine at these gateways. As an ex firefighter I would always recommend crating your dog as in an accident something weighing from 10 – 30+ kilos will cause a lot of damage to both itself and anything it hits! trust me on this I have seen the results! We are off again, to Spain via the Santander ferry, in October, we managed to get a dog friendly cabin so that Lucy can stay with us throughout the trip. Back via the Eurotunnel late in November. I’m kind of using this extended trip as a fore runner of a complete winter stay away. Came back by Chunnel with some friends earlier this year and it’s a doddle except for the trip afterwards unless you live in the south east. Our Hymer is an E510, so very similar, we use a plant water spray set to mist to discourage Lucy from joining us at night (well early in the morning) it seems to work although she has learned to hide her head round the back of the curtain now, grrr, Jan only has to reach out for it for her to get the message though. Hi Colin, thanks for sharing your experiences of travelling with your dog Lucy. We have adopted a dog in Spain (there are so many here in need of a loving home) and we are intending to drive back to the UK with her in September via the Eurotunnel. This is the first time we have driven anywhere with our new dog and so it was good to get some feedback from you about travelling with your dog in a crate. I was thinking of purchasing a special harness that works with the seatbelt in order to secure our dog as she is too big really to go in a crate, I don’t know if it would fit in the car with all the other stuff that we need to transport. Do you know anything about these harnesses, just wondering if anyone has any experience of using one ? Lucy is a rescue pup as well. She weighs in at around 25 kilos and fits nicely in a 36 inch crate with room to spare. We stop every couple of hours at lay byes or service stations and she gets out to stretch her legs and do other doggy stuff. Never tried the seat belt attachment so can’t comment really, the one reason we were against them was that the dog seemed even more restrained than in a crate, and as Lucy tends to wiggle about a bit before settling down we went for the crate option. I expect that the doggy seat belt works just as well though. Lucy has a soft crate that goes in the car and she uses it as a getaway at home as well, it’s made of canvas with a plastic frame inside. Got that one from Pets at Home, the crates were a online purchase. Considering taking my lab with me to Portugal, Algarve to be exacty. Is there a website with a list of local vets at tourist destinations? Thanks so much Colin that’s really helpful. The only thing that concerns me though is that from what I can tell a crate doesn’t actually get strapped into the car via the seat belt or anything so wouldn’t it move in an accident ? (sorry is this seems like a dumb question. The crate normally is in the boot of the car (hatchback type), so that it is up against the back of the back seat. If you were to put it on the back seat you could probably deploy the seat belt around it though. In our RV it is under the fixed table between the drivers seat and the captains chair on the other side of the table so is kinda wedged in. When we stop for the night it gets collapsed and Lucy’s bed goes on top (although she usually sleeps on the settee). If we stay anywhere for any length of time the crate goes into a locker. Mainly so that I don’t keep smacking my knees on it under the table. Hope that your trip to the UK is successful, we will be going the other way in October via Santander down to the South for a bit of sunshine (I hope). Many thanks Colin, enjoy your trip down south, I’m going to miss the Andalucian sunshine! Hello fellow doggy people. We planned to take the dog to Italy via Eurotunnel but left it a bit late and now prices are ridiculous, so we’re looking at the ferry. Bit worried about leaving dog in the car on his own with just a few wardens lurking about. Are we silly to worry about this? Seems ridiculous and antiquated that we can’t take him up on deck. Any reassurance much appreciated, thanks. You don’t say which ferry you are taking, but if it a short crossing and pups is kept in a crate there should be no real problem. We made the same mistake when going over on the Le Havre ferry earlier this year. Lucy stayed in her crate overnight on that trip, but as she usually sleeps in a crate overnight anyway there was no dramas. We just needed to stop at the first opportunity to have a walk! The Chunnel is definitely best as you aren’t separated at all and it’s quick. We have managed to get a dog friendly cabin for our trip to Santander later this year and I think that other ferry routes offer similar opportunities, although they sell out fairly quickly. Have a nice trip and hope that everything turns out OK. I was really interested to hear that you plan to take your dog in a camper van and to travel to Spain. We hope to do the same next year, but we are a little nervous about ferry transport and any other problems that may arise with a dog. Have you done this before and what advice would you give? We are travelling to Santander in October this year on Brittany Ferries and have managed to secure a dog friendly cabin, so Lucy can stay with us for the whole trip. Probably be a bit restrictive at dinner time (for us) but we think it will be better than her having to go into a kennel or be kept in the RV as happened on the Le Havre route. We had great fun in France though, visiting the Dune de Pilat was good as Lucy could tow me to the top! You must book as early as possible to get the dog friendly cabins as they sell out quite quickly. We did ours through the Caravan and Camping Club as they could look through the booking system to find the earliest date a cabin was free, if you do it yourself you just have to keep putting a new date of travel in till you strike lucky! You will need a muzzle for travel as they insist on all dogs being muzzled whilst on board, Spanish police don’t like looking into vehicles with unmuzzled dogs either. Although as Lucy is in a crate it doesn’t matter. Hope that this answers a few questions, if there is anything in particular you would like to know then just ask. Hi there, what a great doggy travel post! We’re planning on driving to the Netherlands from UK (via Eurotunnel) in August and wondered if any fellow doggy folks knew whether we would need to see a vet in each of the countries we would be travelling through on our return(i.e Netherlands>Belgium>France>UK)or do we just need to see a vet in France for our return to UK? It would be great if you could suggest any good vets used in France/Calais too! Also has anyone ever done this trip before and could share their experience? This is our first doggy hols and i must say i am a little nervous of all the requirements etc! Pet passport & Vacs all sorted. In May this year we took out two golden retrievers to Gent, then Antwerp and on to the Hague. This was our second trip with our dogs as last year went through Germany to Strasbourg. You only need to see a vet in a single country. Has to be at least 24 hours and no more than 5 days before you return. Most hotels know of nearby vets and we used on in the Hague (which has a very dog friendly beach). Tick treatment and worming tablets should cost about 25 euros per dog. We took our dogs in EVERYWHERE – no need to ask if you can take them into restaurants etc. We stayed in the Antwerp and Hague Hiltons and the Carlton Hotel in Gent is great and very dog friendly. We are going to Holland with our German Shepherd next year. I know about pet passport eat but vets receptionist said there may be other requirements such as muzzles eat. As you have been last year are you able to give us some advise. I have tried finding out more information but it is really difficult to find any. Any help would be greatly appreciated. have signed and shared this petition having used Eurotunnel with animals regularly i have never noticed this ,thanks for highlighting it and i will be sharing with other animal welfare friends …..
We are travelling to Europe in September for 12 months travel and we are taking our Beagle with us. Is anybody aware of any insurance company’s that would cover Bam for 12 months travel?! Am travelling to northern France in mid- September. Am still confused by what flea/tick/worm treatment is advised prior to travel. My dog is treated with Advocate once a month and wormed with droncit every 6 months. How should I cover him for ticks – maybe use frontline instead of advocate? Any advice would be gratefully received. thanks. The only thing you must do is visit a vet between one and five days before you travel back from France to have the proscribed worming treatment administered. Your vet will be able to give you the details. Your normal flea and tick stuff will be fine for travelling out with. We always take a tick removal tool with us but haven’t had to use it yet. Some people buy special collars for the sand fleas but they can cause problems like itching or affect the skin of some dogs. Personally we have never used one for Lucy as I rely on the Frontline treatment that she gets at home. If you buy one of these then I suggest you read the reviews first then make your own mind up. Just a note to say that we do as the French do and as the French vet advises and use scalibor collars without fail in the south in the summer. Leishmaniasis is a very bad disease, possibly fatal. Frontline doesn’t protect. Our dogs have not had any reaction but some itching is better than leishmaniasis. It’s not worth the risk in our opinion. Thank you for your reply. We are not travelling to the south in summer so maybe a scalibor collar is not necessary. However, I would like to cover ticks, which of course advocate does not do – this is my problem! My dog has had fad, which is why we use advocate, and I don’t want to increase his sensitivity. Have talked to our vet and think we will opt to use frontline on a one off basis, to cover ticks, provided there is no conflict with the advocate. A small but niggling problem! !Many thanks again and I find your advice very useful. Our Labrador wore a Scalibor collar last year for our holiday in the South of France, with no reaction at all. Plus his usual flea treatment. Interestingly, we have bought the same collar this year as we have had awful tick problems at home, and it has worked perfectly. Remember if you are using a Scalibor collar they are different depending on the size of your dog. Also once wearing it they should not go swimming as this stops the collar working. We used one when taking our two retrievers to Strasbourg and they had no problems but this year when we went to Belgium and Holland did not bother. We are travelliing to Normandie next month with our staffie, it will be our first trip with him,and will be staying a camp site in Veules-les-Roses F76980 anyone know of any vets in this area. I have been using the website http://www.goo.gl/maps/dGJM to find vets in France who are familiar with the passport system and it is brilliant – gives all the info you need! We want to buy a lab retriever from a registered breeder in Germany. The pups are expected end of September and would be available to pick up end of November… We live in Switzerland and wanted to travel to the UK to spend Christmas with family. How early are/can puppies be vaccinated? I heard it’s a bit of an ordeal for their immune system. Driving back from Venice with my dogs in November. Last time we used the fabulous vets in Ardres as recommended on this site but it was pre-season in the Boulogne area, a lot of businesses were closed, the weather was poor and the minimum 24 hour condition left us really BORED! Anyone know of a Vets Passport vet in Belgium/Holland/Germany/Switzerland ? All the information you have put on this blog- all very useful! I hope you don’t mind me messaging but I was wondering whether you could give me some advice re eurotunnel travel. My dog is Spanish originally with a Spanish passport. I am travelling from Italy up through France to the tunnel. My vet is in Italy. If my vet gives the tapeworm treatment on Saturday evening and the eurotunnel we have booked leaves at 5pm on the Monday evening would this be alright? And am I right in thinking that flea/ tick treatment is no longer required? Have a read of our answers to frequently asked questions page to set your mind at rest. You will be ok with the tapeworm however you must have the tick treatment at the same time or you will not be allowed to travel. Hi Richard, thank you very much for your advice. I have actually just been in touch with defra and they have told me that flea and tick treatment is no longer required. What makes you think it is? advice please on requirements for dog travelling to portugal via spain (santander ferry). i have a valid dog passport which covers the requirements of entering portugal from uk but my vet (and neither can i) cannot find any info on entering portugal from spain. as we are booked to go on september 23 any speedy lnfo would be gratefully received. Going to Southern Spain in October, also via Santander ferry -managed to get a dog friendly cabin! – Leishmania prevelant there so using Scalibor collar and administering Advantix to Lucy as proscribed. Apparently there is a jab called Canileash but our vet hasn’t heard of it but is investigating for us. Also have to watch out for processional caterpillars (hairy little beasts) as well. Just don’t let her near any I s’pose. I don’t think you should have any problems entering Portugal as the borders are all open as in the rest of Europe. The doggy passport with relevant entries for Europe should suffice if asked. Hope that you have a great time in Portugal, we lived in the Lisbon/Cascais area for three wonderful years back in the mid eighties. Used to visit the South for a steak and kidney pie about once a year, lots of English speakers in the area, Faro was nice also the border area between Spain and Portugal by the river, a lovely drive with lots of little stop offs. We are taking our dog to spain for the first time this year and have managed to get a pet friendly cabin! Are dogs allowed to stay in the cabin alone for a short while whilst we go for something to eat? We left Lucy alone in the cabin while we ate with no problem at all. We did take her travel crate with us to the cabin and she lay down in that while we were out, don’t think many others did though. We did it simply so that we could sleep on the beds without being shoved off half way through the night by a dog wanting more room! There were two sets of bunk beds so I suppose we could have used the upper bunks instead, although I don’t think that would have put her off the attempt. If you are going on the smaller of the two ferries the dog walking area is a bit limited but we were allowed up on to the deck above after asking which was great but blowy. Hope you have a great trip, we are going out again later this year but will travel down through France having crossed via the Chunnel. thank you colin for your reply. we are going to be living in central portugal (a little place called santa comba dao) for a while until we find a place of our own. our lurcher dog dylan is very outgoing and it will be a full time job looking out for these migratory caterpillars. is there any measures i can take take to protect him from these creature should he come into contact with them. i think i read somewhere that an epi pen (ie a shot of adrenaline) might help until veterinary help is available. anyone have any insight into these caterpillars of doom? I looked them up on the web. Couldn’t really find out even what time of the year they are around, I assumed late summer like ours before hibernating to become butterfly’s (or maybe moths?). I did find out that they should be reported when found as the local environment people will destroy them. Apparently they cluster in colonies, usually around pine forests. I didn’t see any treatments recommended but I’ll check about your epi pen. Leishmania is a problem in Portugal as well according to the map so a scalibor collar and Advantix would be a good idea. My vet rang back earlier to let me know that Canileash is a vaccination that is available but the dog needs a blood test first if it has been abroad before and that the course of injections are administered over a nine week period and the dog has to wait a further 28 days before it would be effective, so no good for us as we leave in three weeks time. I did discover that you can get a doggy equivalent of Skin so Soft Citronella spray which is a definite help against mossies and midges both for us and them. I’m indecisive about the sandfly collars??? How do experienced pet travellers rate them??? Mixed feelings on this, my dogs have bever wore a collar for any time other than walking as i think it spoils their fur and must feel like a human does with wearing a constant tie around their neck!!!!! How likely is a sandfly problem in gran alicant in Spain?? Jayne, If your dog isn’t eating I would get her/him to a vet. Are there other symptoms? Dogs always eat unless feeling quite unwell. And yours is a lab! Of course some labs are picky eaters but I would be straight to the vet in this circumstances. At least she is taking tip bits a good sign! Hi Jayne, it’s mossie time in some parts of Southern Spain. Look up leishmaniasis on the doggy disease sites and a collar doesn’t seem so bad. I know that the scalibor collars can cause itchiness etc, for some dogs, but we are going over on 10th Oct and are going to use one as well as Advantix and the doggy equivalent of citronella skin so soft. I was convinced on the advantage of the collars having read a few owner experiences after advice on this site from the editor. Then found out about Advantix and the anti mos sprays. The worst time, apparently, for the little blighters is early morning and dusk (as well as all night if one is in the motorhome)! And guess when our dog really wants to go out? 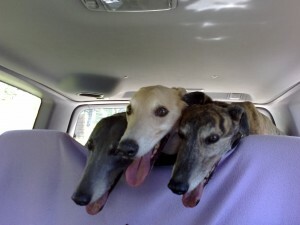 We are driving down to Southern Spain with our two dogs in January. It is the first time we have driven down and we are worried about finding suitable accommodation en route. A friend has recommended somewhere to stop near Paris which now leaves us looking for somewhere very close to the E15 / A7 between Perpignan and Girona. Has anybody else done this route and if so, could you recommend somewhere that is easily accessible from the motorway, clean, comfortable, dog friendly and with somewhere to eat close by so we don’t have to leave the dogs on their own in the car very long whilst we have dinner. I hope someone can give us suggestions. Thank you. We’ve done this route lots and lots of times. Two hotels, one in Figueres, the Hotel Ronda, very dog friendly and one in Girona, the Gran Hotel Ultonia. we stayed at these two in September, one on the way down, one on the way back with our lurcher and podenco, both big dogs. If you stay in the very south of France, close to the border, you should be able to find a hotel with a restaurant that will let your dogs in with you. Hi, I wonder if someone could help me, we are thinking of travelling via the Euro tunnel from Uk to France, and taking our German Shepherd dog with us, we will be travelling Friday evening and returning Sunday evening (weekend), we are sorting out the pet passport, but need to know if we need to see a vet in France before we return as we will only be there for 2/3 days max? Yep, you will need to see a vet for the worming treatment (a jab or a pill) and have the passport signed and stamped by the vet before returning. Best to look up vets in the area you will be and organise a visit before you go or you will end up spending most of your time and a lot of money searching for a vets that is open on the Saturday. Expect to pay between 35 and 50 euros. The closer to the embarkation area the dearer it seems to get. We paid 35 euros in Tours earlier this year but are hoping to call in to Surgeres on the way back from Spain in a weeks time (good wine merchant there as well). We’ve now been in the south of Spain for over a month staying on a campsite in our motorhome with Lucy our cross Weimerarner. She has worn a scalibor collar for the whole time with no outward ill effects. There are a lot of flies about, but only the annoying housefly type. No mossies, but that could just be where we are. I have found out that the processional caterpillars are only a problem in the first two or three months of the year, and then only in pine forested areas where they all hang in a bunch in the trees before dropping to the floor. It is their hairs that cause the problem to our furry friends and can be fatal. Apparently they aren’t too good for us either. Toads are another thing that you shouldn’t let dogs play with, as they give off poisonous goop. All this info has come from local ex pats that have their own dogs over here. One thing that I did buy that has been of enormous value was a doggy bag towel. A dry dog is a less smelly dog and in the close confines of a motorhome or car has been a blessing after a few trips to the beach that heady aroma of ‘wet dog’ has been avoided. We start to head back tomorrow, driving up through Spain and France to the tunnel and back to the UK. We’ll stop in Surgeres to visit the vets, or if they are shut then on to Tours to the vet we used last time. Although it’ll be a shame to leave the sunshine I am quite looking forward to the dog friendly French and their patisserie’s and cakes. Great site.We have been looking for your “how we travelled page” without success, so will put a question here if we may ? Question is; as it’s about an 8/9 hour train journey down to Nice from Lille are there ANY long comfort stops during the journey for her ? Also any tips at all from anyone who has done this trip or similar would be so very welcome. Thank you! I have just discovered your fabulously informative and beautifully displayed blog site. So many thanks and congratulatio for you blog. Haven’t used that ferry crossing but did do the Portsmouth to Le Havre on an overnighter. Lucy just curled up in her crate in our motorhome and went to sleep as that is what she is used to doing overnight, so no worries on that trip. Coming back through the day was a bit different as she took umbrance at being shut in the crate during daylight hours and decided to chew up her bed in protest. We have also done Portsmouth to Santander but managed to get a ‘dog friendly’ cabin which was nice. The best was the Chunnel as it was so quick, although a lot of driving at either end. Thanks Colin! We are now back from our travels, we used P&O from Zeebrugge to Hull,ca. 15hr crossing.Our furry friend was put in the ‘Dog House’ on the car deck and despite my concern he was very well looked after. We managed to visit him in the evening escorted by a friendly ship’s policeman and we were told they were looking in on him every hour. As mentioned he is quite a nervous dog (earthquake rescue!) but he seemed absolutely fine. We were told due to some recent incident that dogs are not allowed to stay in vehicles now on that route. We returned on the Dover to Dunkirk crossing & he sat quite happily in his basket in the back of the car. Really think I was the one who suffered the most!! Hi, I am wanting to go for a weekend in Germany. If i am only there for three days will my vet in GB be able to administer the worming jab to my dog just before we leave GB? Or do we still need another jab in Germany to return? Thanks, Candy. Yes, your vet in the UK can treat your dog before you leave. Info here re: day trips but that would apply in your case. You have to visit a vet between two and five days before your return to the UK to have the worming tablet/jab given. Your vet in the UK can’t do it before you go. I do wonder that as we can be trusted to go to all the trouble of getting our dogs ready with the relevant jabs documents etc that you need to go abroad with them, why we cannot be trusted to self administer a worming tablet before return? Finding a vet that knows the requirements and doesn’t charge the earth is another challenge altogether. I would suggest that you visit your vet and get the written details of the requirements for return, some vets think they are required to do a full health check including flea and tick treatment which is no longer a necessity. Hope you have fun in Germany . Hi I am travelling to ssint James in southern normandie next month. Can anyone help recommend an English speaking vet who is authorised to approve the dogs passports for the return journey back to the UK. I have read that all vets in France can approve the passports for the return journey to the UK is that true? Can anyone help with my question from yesterday please. The nearest to where you will be where I have used a vet is Tours. The vets name and address are, Thierry Pallaoro, 146, Avenue Stalingrad, 37700 Saint Pierre Des Corps. He is English speaking and knows all about the pet passport. I think most vets in France are aware of the scheme and I’m sure you will find one closer to you. They do seem to prefer an appointment to be made but all you need is for the worming treatment as proscribed by DEFRA. The wormer must contain Praziquantel. On both occasions we have had Milbemax the vet will then fill out and sign page 16 of the passport. It’s all very straight forward and you will wonder why you were worried afterwards. Don’t forget that it must be within 1 and 5 days before your return that you see the vet for the treatment. Thank you very much for your kind reply. Tours is a bit too far from lower Normandy but I really do appreciate you taking the time to reply. Hi Catherine, If you go the Pages Jaunes website (yellow pages) you will find a list of vets in the area. If you’re not fluent in French use the Free Translation site to compose an email in French asking for an appointment at the vets you choose. We’ve used vets in France several times and managed even though I only have schoolgirl French. Another one we have used is a French Tourist office and we have gone in with a vet’s phone number and asked them to call and make an appointment for us. Alternatively your hotel or accommodation may be able to recommend someone. WOW! Just came across this blog and it has everything we need to know. We are planning on taking our dog to France for the first time this Summer and we were worried about all of the bureaucracy that we might come up against! We have found a lovely campsite and looking forward to booking it, but I was having reservations about what we would be letting ourselves in for – happy to have my mind put at rest! One thing – I seem to remember reading a couple of years ago (before we chickened out and booked camping in Scotland!) that my dog would have to wear a muzzle in French Customs upon arrival in France and before leaving – is this the case? I think he might just freak! If anyone has any info it would be much appreciated, Fabulous blog by the way!! Depends on the size and demeanour of the dog. We have never had to muzzle our Weimerarner but I always have one to hand (a soft cloth muzzle) just in case someone complains or insists. At customs you are usually asked to scan your dog yourself and hand the gizmo back to the officer for verification with the passport. We have never had any problems. We took our Staffy last year to Francs and we had no problems with the checking in as Colin says. The only thing with France they are charging 40 ero at the vet for checking his passport!! and 3 worming tablets. We also have the soft muzzle if required. Cheers hope all goes well for you. On the point of muzzles it is always worth training your dog to accept a muzzle early on (with positive reinforcement) because you never know when the laws in this country may change to enforce muzzles in certain situations (the anti dog lobby are always pushing). Just a thought. We’ve never had to muzzle our dogs either in the 12 years we’ve been using the Eurotunnel. You will have to keep your dog on a lead on the campsite though. Don’t forget, the soft muzzles should only be worn for a very short time. Dogs don’t sweat so lose their heat through their tongue when panting. The soft muzzles stop them panting properly and increase the risk of heatstroke. Thanks for excellent informative website, this has really helped me plan our trip. I am taking my 6 year old Labrador to Brittany in May for the first time, crossing through Eurotunnel. Can anyone advise on European car breakdown cover that includes dogs? I don’t anticipate breaking down but you can’t be too careful. Any other tips gratefully accepted. I am planning a small trip (25 days) around some places of my interest in Europe next June, and off course I am taking my dog with me. I am trying to find camping during the trip where my dog can stay with me. Any recommendation for example in Montpelier, Marsella, Florence and Barcelona????? In this places is been really tricky to find a good place. Also If maybe someone know about the transportation in Ferri… I know dogs are allowed but I do not know is with the leash or do I need the crate? Thank you everyone and best wishes to all!!! Best suggestion for you is to visit Vicarious Books on web and order the ASCII Campsites book. This will give you all the details of which sites accept dogs (most do) and will also let you know how much each site costs. With the card provided with the book they will all be 12, 14, 16, or 18 Euros a night. This can easily save you the cost of the book over just a few nights stays. Also the French camping car Aires are fantastic (not the motorway Aires – don’t stay on those overnight). You can get a book on those from V Books as well. We tend to stay a couple of nights at Aires then visit a campsite for the amenities. The ferry accommodation for dogs varies with the length of the ferry journey. Longer journeys will probably mean the ferry kennel, shorter journeys you can leave in the car/ motorhome. We have decided to use the channel tunnel in future even though it means a five hour journey to get there as it’s quick, painless, cheap (if pre booked) and you stay with the vehicle and dog for the 30 minute trip. Hope you have a great time, June is a bit busy for us but we’ll be over again in October. Hi there, absolutely brilliant blog, wish i found it sooner. We have been to france many times with our 2 miniature labradoodles and thouroughly enjoyed our time, however 2 has become 4 and i am now finding it difficult to find caravan sites that allow this number of epets. Does anyone know of any sites in Normandy, Piccardy or even Brittany that do. Does anyone know if you can get travel insurance for your dog which lasts for 1 year? We are taking our dog to France & Spain with us and we’ll be away for 1 year. I can’t find anyone that will cover it! Great post and lots of informatio, thank you..
We are traveling from Andalusia to Ireland with our 2 dogs (Weimaraner and Boxer cross) and planning 3 overnight stops on the way to the ferry in Cherbourg. One in Salamanca, one in Bordeaux and one in Cherbourg. We are having a bit of trouble searching for a hotel or b&b with Kennels. Do you guys have any suggestions? Our dogs travel in the back seat of our car and have never been in crates so ideally we would like a kennel in the (secure)grounds of the premises. We want to take out 15 year old mini Yorkshire Terrier to Switzerland. My concerns are about her having the rabies injection to start the passport process and wonder if any dogs have had reaction to the rabies injection. My second problem is that she is a fussy eater and not motivated by food so am worried that the vet in Switzerland might not be able to administer the worm tablet. I see on here reference made to injections so is that an option and are here any side effects. Thanks so much. Our Weimerarner cross didn’t even notice the jab and there were no noticeable side effects. Haven’t heard of anyone warning about them either. The vets in France (well, the ones we have seen) offer the worming treatment as a jab as well (it’s probably more expensive). The treatment must be given between one and five days before return and the only advice I can give is to get it done as far away from your return port as possible, as the closer you get the more expensive it seems to be! No side effects from the worming either as far as our dog goes. Hope you have a nice time in Switzerland and that Yorkshire Terriers are good on the slopes. Just thought I’d mention that we just organised pet passports for our two border collies and they both had the rabies vaccine. They were both off their food for 2-3 days afterwards and had some diarrhoea. After that they fine. I spoke to the vet and they said this was not on their ‘reactions’ list but I have checked the Net and seen this mentioned on several US sites. Thought you might want to know just in case you dog has a similar reaction. Thanks Nigel – I will bear that in mind. I wish there were drops like flea drops for worms that can be rubbed in their back! Sorry so late replying, there is a vet on the high street in Honfleur (next to a cafe I think) but no idea how much or if you need to book up an appointment. Can a breeder legally stop you from obtaining a pet passport if they are against you taking one of their litter abroad? Unless you have entered into a legal contract with the breeder that prohibits you from taking the dog abroad then, no. Even if you have I would question the breeders right to demand such a restrictive covenant. Personally I would get the darned passport even if I had no intention of taking the dog abroad just to make a point. As long as the vet is happy to issue the passport then get one. Just wanted to warn anyone trying a Scalibor collar on their small dog to be very careful. We have recently moved to Southern Spain so obviously very worried re sandfly etc. the first few days of wearing my Yorkie (Scotty dog size) scratched something terrible, loosened collar, however what I can only describe as chemical burns came up on his neck and then it started to affect him neurologically! He was acting as if he was on some kind of bad drug trip! We removed collar and within 30 mins he was back to normal. Googled reviews of collar on various sites and found this is huge problem for small dogs – cocker spaniel size and under! Be very careful with these collars I bought a small/medium. We have now visited vet and he now has a liquid product which will hopefully protect as well! You only have to visit a vet between one and five days before you return and have the worming treatment given before you come back to the UK. This will be noted in the passport by the French vet. You don’t need any proof of worming to go into to France. Get it done as far from your exit port as possible as it will be cheaper. Enjoy your trip, the French love dogs, although I would suggest getting a soft muzzle for walks as he is a big dog. We have a side lead which is an anti pulling lead that goes over her nose as well, a bit like a haltie but softer and doesn’t ride up into her eyes. Wanting to take our 3 dogs from the Canary Islands to the UK. Does anyone know if there are restrictions on certain breeds. Have an American Staffordshire Bull Terrier, but have licence/ insurance for her in the Canaries. Lots of French beaches are like ours and do not allow dogs in the summer months. You can usually find one that does (or hasn’t got any signs that you can’t anyway). We always make sure that we use doggy bags so that people can’t take umbrance. There are plenty of lovely walks around although we usually go South of Normandy and Brittany, campsites are usually close by these walking areas so we found. A couple of attractions in Normandy that I would recommend are the Mont St Michael (great walks from the car park and close by) and the Coquerel Calvados maker at Milly. They make really nice cider as well! If you want to go there stop at the ‘You are Here’ sign in Milly for directions (it’s the next right if you arrive from the same direction we did). There are loads of lovely little villages around and stopping for a beer or a coffee will get you talking to the locals and they are full of info on their areas. Enjoy your stay, I’m sure you will. We took our ten year old miniature schnauzer through France, Germany, Austria and Italy may 14. After about five days she became unwell and went off her food which was totally out of character. Since then she has been unwell, she has had many tests and seen the vet on numerous occasions, she has lost a lot of weight and is now underweight. She has episodes of sickness and diarrhoea and vets haven’t been able to diagnose anything. I’ve told them about going overseas and her sudden illness while there. Now getting desperate, does anyone have any ideas of anything she could have picked up while there to cause this. Thank you for replying, she did have a tick on her but her symptoms don’t fit with this. The vet said her blood tests did not show an immune reaction to parasites. She is having a scan to her abdomen on Thursday so hope they can find something we can have treated. Hi thank you for the link, I’ll read it and see if anything fits. Unfortunately she is no better, the scan showed she has a chronic inflammatory disease throughout her digestive system. They think whatever caused this has gone but left a permanent inflammatory reaction. we are taking our disabled cat with us this year, due to pet sitters letting us down. Has anyone taken a cat with them? she comes with us around the UK in our motorhome but this is our first European holiday with one of our pets. I need a vet close to Calais or near a nice touring site on way to Calais. We leave through the tunnel on the 28th August after 5 weeks of touring. Most French towns have a vet much like in the UK so finding one shouldn’t prove too much of a problem. I assume that cats have to see a vet between one and five days before return the same as dogs. We have found that the further away from the terminals you are the cheaper the price. Don’t know where you are travelling from to get to Calais but we have used vets in Surgeres and Tours before now. Surgeres is nice as the vets is directly opposite a nice coffee shop. You generally have to make an appointment 24 hours in advance or they treat it as an emergency visit and the charges go up. We stayed at an ACSI site in Surgeres for a few days ( the local cave is good for wine too) and organised an appointment the next day. Vet was nice and spoke good English and understood the pet passport system. Hope that you have a nice time, we will be over there again in October. Best to ask a vet regarding lungworm, other than that an investment in a Scalibor collar would be advisable. Some dogs have a reaction to them but our dog, Lucy, was fine with it. I too was a bit unsure of the Scalibor collar until I read up about leishmaniasis, please do the same then make your own decision. Make sure that you get one for the correct size of dog. Also ask your vet about the type of worming treatment required before return to UK. It must be administered by a vet and logged in the passport, your Drontal tablets are good for UK but we have always had Milbemax given by the French as it contains Praziquantel, this is the tapeworm treatment required for re entry to the UK. Hope you have a nice time in France, we have always found them to be a very dog friendly people. Thank you for your response very useful information. We are travelling from the UK down to Spain through France and on the way up staying in several places in France. Unsure where as yet. Yes cats have to see a vet up to 48 hours before going home. I would advise extreme caution with the Scalibor collars. I have a Yorkie 6.5kg and we tried him with one of these collars, as we have a home in Southern Spain where Leishmania is a big concern. The collar affected him neurologically, he was acting really strange as if he was on drugs! We removed the colllar and he returned to normal! I googled the collar and found there were huge problems for small dogs with these collars, it’s because you can only buy small/medium and they are far too strong for small dogs. We went to our local vet and she gave us an oral medicine which they take for one month leave off for two months, there does not seem to be any adverse reaction and we are really careful of the time of day we take him out and where we take him. Just be very cautious you can also buy citronella spray to rub on before taking them out. Hi Colin, I would like to ask if you can advise me if a dog friendly cabin is booked between UK & Spain does one need muzzles for their dogs? We are taking our 3 miniature dachshunds all of us 1st times & I don’t want to add more stress if they are not compulsory. I must say I have nearly read all the posts & learnt a great deal very useful, interesting & if I have miss the information appoligies. The ferry company ask you to use a muzzle at all times on board, but after we had walked Lucy out on deck once we noticed that nobody else did and as she is a friendly dog we left ours in the cabin from then on. We bought a soft cloth type muzzle that you can keep in your pocket so that if anyone complained then we could put it on. Don’t leave this type on for long though as they can’t drink or pant a lot through them. We normally use a side lead which goes over her nose as well, to stop her pulling, which a lot of people think is a type of muzzle but isn’t really. If you are on the smaller of the two ferries (as we were) the doggy walking area is quite small, we asked if we could use the deck above as well which was approved as the weather was OK. If you are in a car/motorhome the dogs must be muzzled or restrained in a crate/doggy seat belt when going through customs. The Spanish can be quite annoyed if they lean into the car and lose a nose and it is illegal to have unrestrained/unmuzzled dogs for them to face. They sometimes do this to scan for the chip to match to the passport but we have always been asked to do the scanny thing ourselves and hand it back. We had great fun in Spain and are returning in October, with Lucy, who also thought that Spanish bunnies were great, loved the seaside but hated the flies, well we all hated the flies to be honest. There are no regulations concerning crates etc although I would strongly advocate their use as long as the dogs are happy. If they are unrestrained in the vehicle then they will need to wear muzzles at customs or if stopped by the police. If in a crate then no muzzle is needed. Our own dog, Lucy, is a Weimerarner cross and happily curls up in her crate under the table and sleeps whilst in motion. We stop regularly for her to go for a wander at lay byes etc. The reason behind me ‘strongly advocating’ crates is that I am an ex firefighter and have seen the results of loose and heavy objects during a road collision. Not pretty. Oops, got that a bit wrong, as from end of May you must have your dog caged or restrained in your vehicle in France. 90 Euro per dog fine. We are moving to Italy in September we are driving with 3 dogs and 2 cats. Does anyone know if you can stop at motorway services en route to excercise the dogs. We are not planning on stopping overnight. There is no problem with stopping at the motorway services, some are better than others just like the UK, but you will find that out as you travel. As long as the dogs are kept on leads you should be safe as there are usually grassy areas. Under no circumstances should you overnight at these Aire Sevicios though, as you seem to be aware. Hope that you have a nice trip, we are travelling down to Spain in October via the tunnel, down through France and spending a couple of weeks to look around en route. In France there are “Aires” which are rest stops with limited facilities but they are usually great for walking the dogs. There is often a shaded area of woodland where you can get away from the road and (in my opinion) are slightly safer than the small grassy areas you find in service stations. In Italy the “Area Servizio” is generally just like a normal service station but you can sometimes find a slip road just behind the station which may have access to places to walk the dogs. Within the area servizio there are generally a few places with shady trees if you need to get your pet out of the sun but in the fresh air. There are also some parking spots which are shaded but they are obviously popular but great if you can get into one since the car will heat up much less when you take a break. I have tried both methods (driving straight through and stopping en route). I think that on balance it is marginally better (with my dogs) when we stop. There are some good pet-friendly hotels where the dogs can get a good walk and run off some of the anxiety that seems to come from being in a new place. If that takes your interest please drop me a line and I can recommend some good ones I stayed at. I have 2 dogs (30KG +) and while there is often a nominal charge for the dogs there have been no issues with their size. One other thing. You might want to consider window shades for your pets as the car can get really hot in the summer unless you have a good AC system. Even then the sun coming directly into the windows can still be quite warm. I hope this helps, good luck on your adventure! Thank you very much Paul for your information with regard to the Aires. Very helpful. At least the dogs will be able to have a bit of excercise. Still don’t think we will stopover anywhere because of the cats. Think they might be a bit of a problem. Need to get the journey over with as quickly as possible!!!!! I am travelling from Rosslare to Cherburg on Tuesday. We booked ferry with Stena Line but we were told they are fully booked for kennels and our dog will have to stay in the car. However, we can arrange suitable breaks to take the dog on to a walking area. I am worrying sick here because from my previous experience when travelling to Scotland, our car got very hot inside despite windows opened. Would you know anything about this crossing? Also are you allowed to stay with the dog on a dog deck as long as you want? We are taking our dog to France shortly. Do we need by any French law to have him insured? There are no French laws requiring insurance for your dog. French vets can be quite expensive though. Enjoy your visit to France, we go over on the tunnel on the 1st Oct on our way to Spain, really looking forward to it. We are taking our dog from the UK to Spain via France in a couple of weeks. What I wondered is whether there are any specific requirements at the border in Spain? Ie does he need to be muzzled/in a crate etc. Also do we need to take him out of the car and get his chip scanned again? First time taking him away so apologies if this is an obvious question! Unless you keep your eyes peeled for the ‘Welcome to Spain’ sign you won’t even realise you have crossed the border. The only times you will be asked to scan the chip will be in the channel port departure area and possibly when you arrive in France. We have generally done it ourselves when asked to by the security staff. Scanning will only take place again when you visit the vet for the worming tablet and at the departure point when returning home. Dogs are expected to be restrained in a vehicle in France and Spain but it is generally ignored judging from seeing other vehicles. Lucy, our Weimerarner cross, does stay in a crate while we are travelling as she is more secure in there and sleeps most of the time, however we are in a Motorhome and have the room. I’m pretty sure that if she was loose then she would assist me to drive by licking my ears and getting under my feet! If you have a large dog (or one that doesnt like people/other dogs) then both the French and Spanish prefer it to be muzzled. The French love dogs but will cross the road to avoid you if it is a big dog and they have their miniature poodle on a lead. The Spanish less so. You will find lots of strays in Spain. We too are off to France then down to Spain in a few weeks (1st Oct) using the tunnel then off down the Eastern side of France to the Med coast and on into Spain using the coast road to the South. Should be great. Hope that you have a lovely time. We’re embarking on a year long trip round Europe early next year and will be taking our 7 year old Labrador. Does anyone know where I can get insurance for her? I got mine with LV insurance. It is expensive but is for a year and is for all of europe. You may be able to get cheaper in holiday insurance but i think they have shorter time limitations. I live on the Costa Blanca Spain coast. I drove to the UK with my 3 dogs, up through the centre of France, a few weeks ago. I am planning on coming back along the western france route ((Tours, La Rochelle, Bordeaux, San Sebastian, Pamplona, Zaragoza. Does any one have any suggestions for pet friendly places to stay along this route (not campsites, don’t have a tent etc.)?? If you fancy a little detour as far as the Picos de Europa, we had a couple of nights here – http://hoteltorrecerredo.com Fab walks in the surrounding mountains for the dogs and the scenery is out of this world. For other places, try booking.com, but make sure you email the hotel first and check 3 dogs are OK.
Hello, I was just wondering I am taking my dog to France for 3 weeks, I was just wondering because I am taking them for so long are there any additional requirements or doesn’t the time make a difference? I am not an epert but we have taken Harry our 3 year old cross terrier to France twice in the past 18 months. The problem isn’t going into France it’s bringing your pets back to the UK. The UK require a special tapeworm tablet/injection to each dog and it has to be given within a 1 – 5 day window. It will make no difference if you are away for 3 weeks. Just make sure the rabies doesn’t expire but that is for 3 years I believe. The rabies vaccination needs to be renewed every year and you can travel 21 days after the vaccination. You need to deworm your dog for re-entry into the UK, the time abroad doesn’t matter. Have a look at the government website for this information. They have a helpline and they have always been exceptionally helpful when i have called them for clarifications in the past. I could do with some advice from people who have taken long journeys with their dogs on ferries, and/or taken their dogs on the plane. My husband and I live in the Canary Islands and adopted a stray puppy here (mastiff/podenco mix, 26kg), she’s now almost a year old now. I fell pregnant a few months ago and we are planning to return to the UK via ferry in February. We can’t decide whether or not to take her with us on the boat, or fly her home and get a family member to collect her from the airport in the UK. We’ve had her chipped, she has a passport, and we know about the rabies jab and worming she’ll need to get back to the UK. The problem is she’s still a very nervous and needy dog after a terrible start to life on the streets, and we’re still building her confidence. We can’t leave her for 5 minutes without her howling and crying, but life here in the Canaries means we never have to leave her because it’s always warm and we can take her everywhere. She gets terribly stressed in the car – she never needed housetraining (strangely enough) so we don’t have a crate for her. I know the conditions for taking her on the boat are like, as we’ve already made the trip here. Dogs are in cages on the upper decks (and lower decks in winter) and for 30+ hours… I just think that’s too much for her at this early stage in her life. Also, we then have to drive from southern Spain to Calais (the ferry routes from Spain to UK that have dog friendly cabins are already sold out). So it will be at least a 4 day journey in winter conditions, and I can imagine her stress levels going through the roof. But the plane doesn’t sound too great either! However, it’s just 5 hours of stress, rather than 4 days. Any advice from experience would be greatly appreciated! you seem to be well informed and to have quite a predicament. My dogs (also rescue dogs from italy aged 8 months and 7 years respectively) also get a bit stressed during separation. In the past I have obtained a sedative from my vet for the first time my two dogs undertook a long car journey (Rome to Manchester). They were surprisingly ok so I didn’t need it so I can’t tell you whether the sedatives are effective but just that they are available. Since any option to travel will involve separation, the only ‘solution’ may to minimise it. The route i take is Dunkirk to Dover on DFDS seaways (only another 40 mins from Calais). It is a 2 hour journey and the dog stays in your car. You can go and check on your dog as frequently as you need to (ask the purser) although you can’t stay on the car deck during the journey. The temperature on the car deck has always been reasonable even in winter. There are plenty of dog friendly hotels in France. I stay at one near Dunkirk before the ferry journey and it has a lake and vast fields to walk, which is a considerable help in de-stressing the dogs. Staying in hotels was strange for them at first but on the second journey they were well used to it. It is a long journey (2000 km) but I have found that doing it in small bites was better for the dogs so I always do it over 3 days and 2 nights with plenty of walks rather than the 1-2 day journeys I tried at first. Yes, I’ve heard of the sedatives, but the ferry journey from the Canaries to mainland Spain is over 34 hours, so I don’t think that’s really an option for us. The journey across the English channel is the (relatively) easy part, as we can take the eurotunnel and be with her the whole journey, and like you say there are plenty of dog friendly hotels and parks to make the land journey more tolerable for her. It’s just getting to Europe in the first place that I think would cause the most stress, hence why we’re considering flying her back. Anyway, thanks again for your thoughts! I also have rescue dogs from Italy and travel to UK and back frequently with them The first one had a previous owners name in the chip but if you go to your local ASL you can change the name and other details in the database. You may need a letter from the rescue centre or vet to indicate the dog is yours. I had a letter from the nephew of the previous owner (who had died). As long as you have the required rabies vaccination and the pooch is deepened by a vet between 1-5 days prior to e teeing uk there shouldn’t be any need for letters of permission or other documentation. In the passport there is a place where the vet can sign to say the dog is fit to travel and that may be needed by the transport company but we have never been asked for it. Make sure that the vet signs the deworming section in your pooches passport cos deworming yourself is not considered valid. Sorry for the typos. Of course I mean dewormed not deepened! The rules are different in each country. can speak English but don’t practice much. Also fishermen leave fish and hooks. My pup swallowed two. Very scary and expensive. Hi I wonder if anyone can help I am looking to travel between France and the UK on a regular basis, every couple of weeks. I called DEFRA for advice and they confirmed my dog needs a Tapeworm treatment evry time I am reentering the UK. This is worrying as treating my dog for tapeworm every 2 weeks surely can’t be healthy of neccessary. Does any one have any experience of this please? I am a belgian vet and I can tell you it’s advised by Esccap (European scientific counsel companion animal parasites) to deworm small puppies every 2 weeks until they’re 2 mounths and then monthly until they’re 6 mounths old, then at least every 3 months. So I don’t know which vet advised you not to deworm for at least 6 months !?! You’ve got some really bad advise ! I regulary help travelling dog owners to prepare their dog to travel back to the UK and it is necessary to give a tapeworm treatment between 5days and 24h before leaving. Tapeworm treatments do not prevent any infection, therefore it is obligated to repeat it every time. You won’t be allowed to enter the train or boat if the treatment is not done properly by a vet.One might consider not to travel so frequently with their dog because I agree it is not ideal to give a tapeworm treatment every 2 weeks all year. I’m not a vet. But from experience vets opinions vary widely. The deworming regimen depends on the context. The opinion of 2 vets I trust completely was that giving deworming treatments 2 weeks apart wouldn’t be a problem but is not something you would normally do routinely every 2 weeks. I have been in a similar situation with my 2 dogs on a couple of occasions and gave them deworming treatments within 2 weeks; no ill effects were apparent afterwards. Hello – I wondered if anyone has any experience of someone else taking our dog to France? My in-laws live there and are taking our dog for a few weeks in March while we ourselves are out of the country. She has been there before (with us), and has her passport and everything, I’m just unsure of the implications of their name being different than ours on the passport. The vets didn’t know, and when I called DEFRA and they told me to visit the website and search through the documentation and I cant seem to find anything?